Harvard Prof. 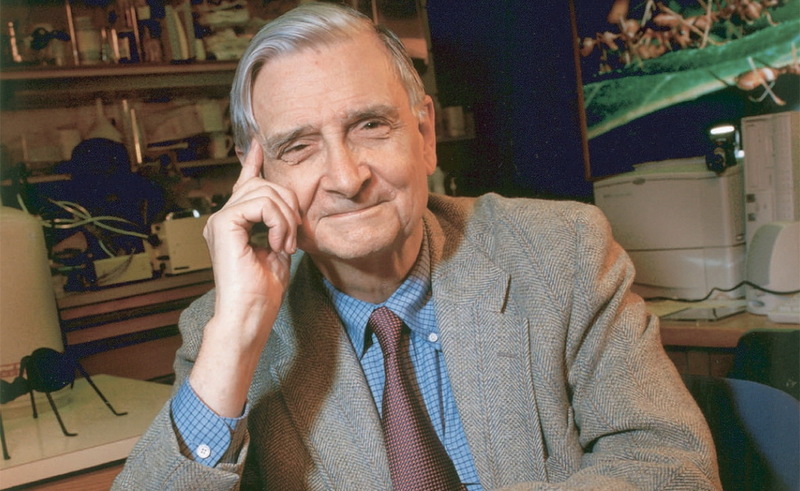 Emeritus E. O. Wilson, legendary biologist and world authority on biodiversity. [From Wikipedia] Wilson is known for his scientific career, his role as "the father of sociobiology" and "the father of biodiversity", his environmental advocacy, and his secular-humanist and deist ideas pertaining to religious and ethical matters. Among his greatest contributions to ecological theory is the theory of island biogeography, which he developed in collaboration with the mathematical ecologist Robert MacArthur, and which is seen as the foundation of the development of conservation area design, as well as the unified neutral theory of biodiversity of Stephen Hubbell. Wilson is the Pellegrino University Research Professor, Emeritus in Entomology for the Department of Organismic and Evolutionary Biology at Harvard University, a lecturer at Duke University, and a Fellow of the Committee for Skeptical Inquiry. He is a Humanist Laureate of the International Academy of Humanism. He is a two-time winner of the Pulitzer Prize for General Non-Fiction (for On Human Nature in 1979, and The Ants in 1991) and a New York Times bestseller for The Social Conquest of Earth, Letters to a Young Scientist, and The Meaning of Human Existence. E. O, as he is univerally known, has been the recipient of many awards, including the Newcomb Cleveland Prize (1967), Leidy Award (1979), Pulitzer Prize (1979), Tyler Prize for Environmental Achievement (1984), Crafoord Prize (1990), Pulitzer Prize (1991), International Prize for Biology (1993), Carl Sagan Award for Public Understanding of Science (1994), Kistler Prize (2000), Nierenberg Prize (2001), BBVA Foundation Frontiers of Knowledge Award in Ecology and Conservation Biology (2010), and the International Cosmos Prize (2012). He published 13 books in the new millennium: The Future of Life, 2002, Pheidole in the New World: A Dominant, Hyperdiverse Ant Genus, 2003, From So Simple a Beginning: Darwin's Four Great Books, 2005, The Creation: An Appeal to Save Life on Earth,September 2006, Nature Revealed: Selected Writings 1949–2006, The Superorganism: The Beauty, Elegance, and Strangeness of Insect Societies, 2009, Anthill: A Novel April 2010, Kingdom of Ants: Jose Celestino Mutis and the Dawn of Natural History in the New World, 2010, The Leafcutter Ants: Civilization by Instinct, 2011, The Social Conquest of Earth, 2012. He published 3 books in 2014 alone: Letters to a Young Scientist, A Window on Eternity: A Biologist's Walk Through Gorongosa National Park, and The Meaning of Human Existence. A full CV for E. O. Wilson is available here.